Is your dog under control? Does your dog growl at you? Do your neighbors complain about your dog growling at them? Has your dog ever snapped at or bitten someone in front of you? What did you do? Thousands and thousands of dogs are put to sleep or given away because these problems are not handled correctly and the situation gets out of hand. This is very unfortunate because in most cases, the problem could have been avoided if the owner just understood their dog. When a dog growls or snaps, he needs to be properly corrected. Not correcting a dog at the time of the incident is like telling the dog his behavior is acceptable. Dogs are not human. They do not think like humans, nor should they be treated like humans. The first thing one needs to understand is a dog responds to the tone of your voice, not just your words. Try this test with your dog. In a friendly, cheerful tone, say to your dog, "You bad boy, I am going to give you away today. You are a bad dog, bad dog." How did your dog respond? Now say in a mad, harsh tone, "You are a good dog. Such a good dog. "How did your dog respond? Here is an example: An owner sees his dog snap at someone. The owner says to the victim, "I don't know what has gotten into him." He takes his dog by the collar and leads him away, saying to the dog, "What has gotten into you?" in a questioning voice. This reaction does not clearly tell the dog that his action was not acceptable. Chances are, this dog will snap again. It needs to be made clear to the dog that you did not approve. Some dogs are more voice sensitive than others. With some, a harsh "NO!" is all it takes. With others, further measures need to be taken. An example is with my two dogs. My Husky mix is very voice sensitive and just a tone of great disapproval will make him cower; the message of disapproval has sunk in. On the other hand, my 70-pound English Bulldog would need a bite in the neck with my hand and a stern tone. He is very tolerant to pain and it takes a lot to even get his attention when he is excited about something. Know your dog’s limits and correct him accordingly. Make sure your dog CLEARLY understands that you will NOT put up with his bad behavior. Let him know you GREATLY DISAPPROVE and will NOT tolerate it. A dog does not understand screaming and yelling and this will confuse him, as fellow canine pack members do not scream and yell; they use quiet, calm and assertive body language. Dogs feel your energy. 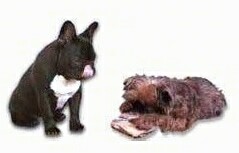 When correcting a dog, a short word or sound such as "No" or "Aaaatttt" is all that is needed. Cupping your hand like a claw and biting your dog’s neck with it is a great way to communicate disapproval to a dog. This mimics how a dog would correct another dog. Your goal is not to hurt the dog, it's to communicate your disapproval. A dog also needs to know that he is not Top Dog.meaning, he is not the boss. Dogs have a natural instinct to have a leader, and a natural instinct to challenge the position of the leader if they feel they are stronger minded. The being that is the most stable and shows the strongest authority will be alpha in the pack. When your dog growls at you, he is saying he is the leader or challenging the position of the leader. If your dog growls at you and you back away, or do nothing to let the dog know that it was not acceptable, your dog has won, in his mind anyway. When a dog wins a dominancy battle it empowers the dog and makes him mentally stronger. Your problems will only get worse. The more your dog wins the worse the problem will become. If your dog growls at you it simply means your dog believes he is boss and is trying to tell you HIS rules. It is time to take control back from your dog. Living with your dog will be a much better experience if you take the time to understand the way your dog thinks.